Ayodhya Eye Hospital started as a sixteen bedded Eye clinic with 10 staffs including an Ophthalmologist. At present it has grown to a 50 bedded hospital with more than 100 staffs including 10 Ophthalmologist & performs around 12 to 13 thousand surgeries per year, of them almost 52% are free. 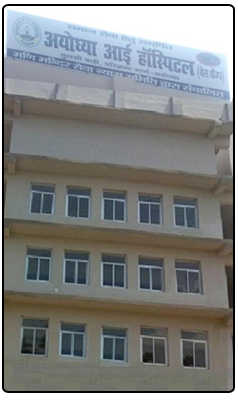 Located at the bank of Saryu River, Ayodhya eye hospital is dedicated for the services of poor in one of the most backward regions of Uttar Pradesh. Situated in the holy town of Ayodhya in Eastern UP about 130 kms from Lucknow, it serves a catchment area of around 3600 sq.kms which includes districts of Basti, AmbedkarNagar, Santkabirnagar, Gonda, Sultanpur, Bahraich, Siddharthnagar, Balrampur & Barabanki. It caters around 2.5 million populations in Comprehensive Eye care services including Cataract, Glaucoma, Vitreo retina, Oculoplasty, Cornea, Pediatrics & Squint as well as Low vision services. 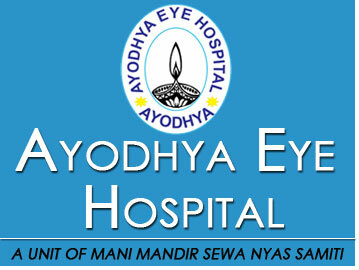 The Ayodhya Eye Hospital was started under the patronage of Mani Mandir Sewa Nyas Samiti and support of Sightsavers International, UK in 2002. Patients are examined using state-of-art ophthalmic equipments that help in conducting a complete eye examination. Visual acuity, Slit lamp examination, NCT, Indirect and direct ophthalmoscopy are conducted routinely for all patients. A skilled team of eight qualified doctors perform cataract (Phaco & SICS Procedures), glaucoma, retinal surgeries, squint, corneal, oculoplasty, trauma and minor surgeries, which with excellent success rate.